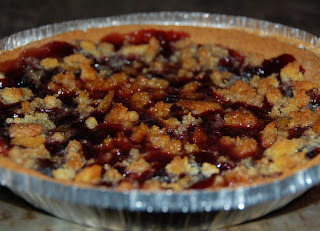 This was the easiest and best (and only) blackberry pie I've ever made! I searched for the easiest recipe with ingredients I had, and it was a hit. These are Himalayan blackberries from the side of the road somewhere in Oregon. I won't win any awards for pretty pies, or even yummy ones probably, but it was voted my best so far. (I've made 3 berry pies in my life). So I'm happy. And I don't even like the blackberries! Here's the recipe from cooks.com.